Water is star at Hotel Quelle: with seven indoor and outdoor pools and whirlpool tubs, a salt water grotto, a biological bathing pond, a Kneipp path, and even a creek running through the gardens, the soothing, relaxing effects of water are everywhere for guests to experience. 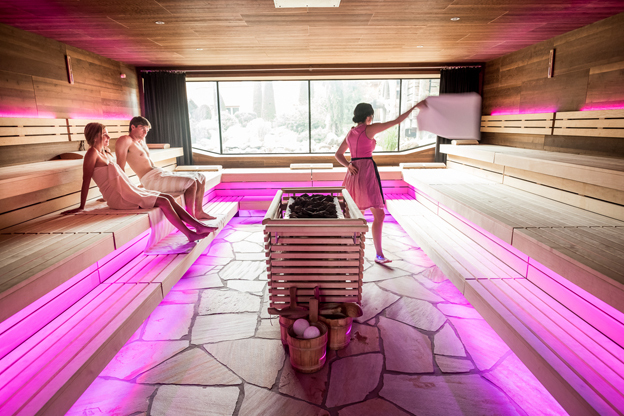 After all, the name of this five-star property in Italy’s South Tyrol comes from the German word for 'source'; and, in the impressive spa and wellness facilities, which boast 48 attractions including ten sauna and steam rooms, water is a protagonist in all forms. It is at Hotel Quelle for example that I was introduced to the practice of ‘Aufguss’, a wellness/purification/entertainment ritual performed a few times a day in the Infinity event-sauna by Andrea, Hotel Quelle's skilled aufgussmeister (steam master). I’m not big on sauna, but I was assured this was an experience not to miss. There are different types of oils and herbs that may be used for the Aufguss, which also includes selected music. The one I attended was tyrolean-themed: Andrea came into the room dressed in typical Tyrolean attire, distributed beer mugs - actually filled with apple juice - while loud Tyrolean music began playing. The door then closed and, in the 90°C heat, Andrea poured water mixed with essential oils on the hot stones of the sauna stove. The water, once in contact with the stones, vaporized and spread throughout the sauna. Using a towel, with skillful and rhythmical movements, Andrea directed the hot and scented steam towards the bathers, who all the while were cheering on her enthusiastically. The Aufguss lasts about 15 minutes with three steam blows; after it, it is recommended to step into the Snow Room, a -5°C room filled with real snow, the first one of its kind in the Italian Alps. It is said that the benefits of the sauna are enhanced when immediately followed by a cooling down phase. You could easily spend the entire day in and out of the sauna, pools, relaxation rooms, and lounging in the delightful gardens, but that wouldn’t do justice to the hotel’s beautiful natural surroundings. Hotel Quelle is located in the peaceful Casies Valley of South Tyrol, a side valley of the more popular Puster Valley, with famous Dolomites attractions such as the Tre Cime di Lavaredo and Lago di Braies reachable within an hour’s drive. Hotel Quelle itself is located at an altitude of 1400m, and its idyllic position amid the mountains is well suited to complement the philosophy that is behind this stellar structure: a focus on nature, serenity, time for oneself and the small pleasures of life. The Casies Valley is known as the ‘valley of the malghe’. Malghe are high-altitude summer farms, where the animals are brought to graze in the summer months; they are typical of the region of South Tyrol. There are 12 of them in the Casies Valley, which can be reached by hiking or biking. 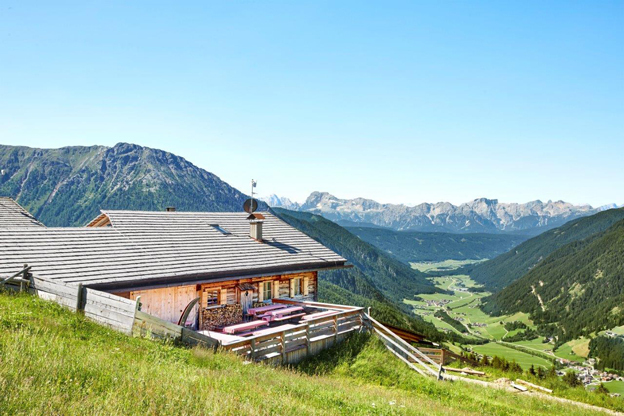 Hotel Quelle has its own malga, Uwald, located at 2042m. Once a week, Hotel Quelle organizes a guided hike to Uwald, part of the rich fitness and outdoor activity program, which is complimentary with your stay. I hiked to it in about two hours directly from the hotel, first passing through the bucolic roads of Santa Maddalena village, then on the trail among conifer woods. Malga Uwald offers a panoramic view over several Dolomites peaks, and the valley of Casies itself – besides excellent South Tyrolean dishes. Typical local food is another draw of Hotel Quelle, whose generous full board includes a rich buffet breakfast with several healthy options, a light lunch, a dessert buffet available until the mid-afternoon, and a 5-7 courses dinner that combines Alpine and Mediterranean flavors. I also recommend stopping by the beautiful bar area before or after dinner to try one of barman Stefan’s unique cocktails. Run by the third generation of the Steinmar family, Hotel Quelle opened in 1952 as a seven-room inn and restaurant. It now has 69 rooms, including 14 suites and 7 family suites, decorated with tasteful Alpine-style design. All rooms feature a balcony with mountain views, a backpack, a spa bag, Wi-Fi, and a mock starscape ceiling above the bed to lull you into sleep. 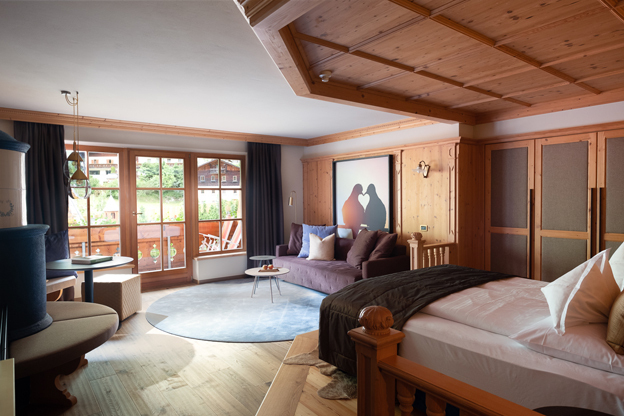 New as of July 2018: Hotel Quelle now offers seven luxury self-catering apartments in the stand-alone Chalet Salena, a five-minute walk from the hotel, for those who desire more privacy, while being able to access all the services and facilities of a five star hotel & spa. The six two-bedroomed apartments and one three-bedroomed Penthouse Spa Suite feature a terrace with mountain views and own private sauna and whirlpool. Also worth mentioning is that Hotel Quelle is very family friendly, offering a free program of activities for children aged 3 and over, including creative play, walks, fitness , movies in the hotel’s cinema, and a dedicated children’s space. Prices start from €1,050 per person based on two sharing for 6 nights on a full-board basis. Family rooms, sleeping 3 to 5 people, start from €1,110 per person for 6 nights on a full-board basis. How to get there: The nearest airports are Innsbruck (119km), Venice (250km) and Munich (280km) – two, three and four hours’ drive respectively. By train, the nearest station is Welsberg station via Bruneck.